Sharon is a human resources manager with a passion for reading and research and hanging out in her own backyard. Building a small backyard patio by using simple patio design ideas is much easier than you think. 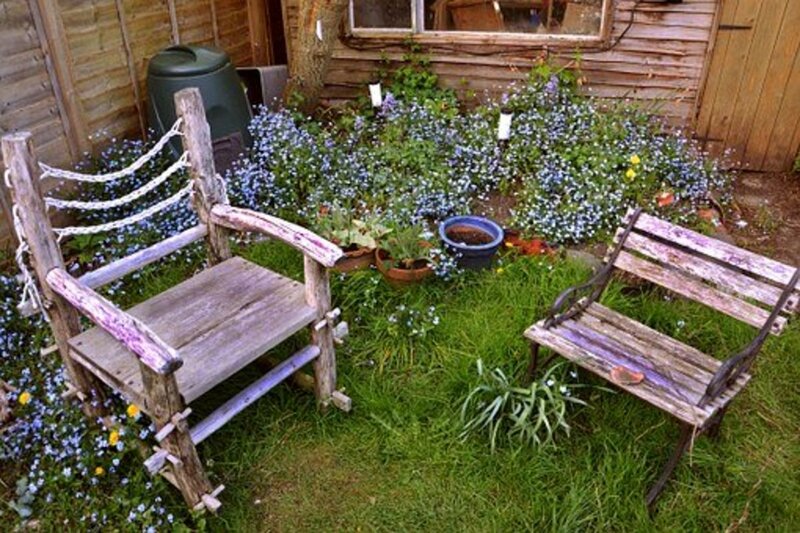 It doesn't matter the size of your yard; you can create a small corner sitting area that is the perfect place to relax and unwind. Creating an outdoor space is a very economical and cost-effective way to enjoy a "staycation." If you are not familiar with the term "staycation," it basically means taking your vacation at home locally, and that can be as local as your own backyard! Relaxing in your outdoor oasis eliminates the stress of traveling to other locations. There are no planes, trains, or automobiles to drive or catch. We tend to spend our precious vacation time in transit, and it is also costly. Don't forget about all the stress of preparation; there are no bags to pack when you relax at home and no stress thinking about what you may have forgotten to pack either! How do you create this oasis? A first step is to investigate the many cheap patio ideas that are outlined in this article. Deciding on the material you would like for your patio is key and it is as easy as a trip to your local home improvement center. There are many methods for laying the various types of stone that are not beyond the capabilities of the average homeowner. This article will focus mainly on stone patios, however, you can click on the link at the end of this article if you are interested in "loose materials." 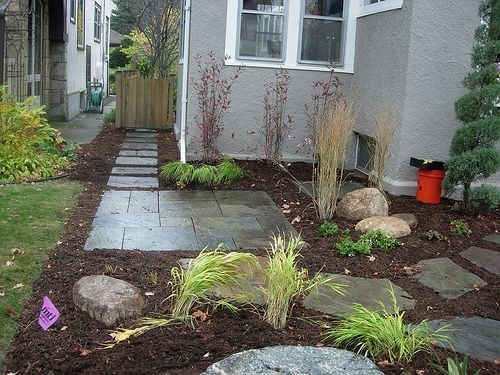 These are very easy to do yourself and include mulch and pea gravel for example. A blade saw is used to cut stones to specific dimensions and is not a necessary purchase, but if you have decided on a patio style with precise shapes you can easily rent one of these from your local home improvement center. Remember before digging to always check with the city for locations of any underground cables. Be safe! Decide where you want your patio. This is important because you don't want to be baking in the sun if you would rather be cooling in the shade! So remember placement is important. Think about the time of day you will use it the most and where the sun will be at that time. You may want to place it under some trees for shade. It all depends on your personal preference after all this is your little getaway spot. Measure off the length and width of your patio. Decide how much room you need. Do you only want enough room for two chairs and a small table or do you want to seat your entire family? Mark off the area with some stakes and twine or even with an outline of flour on the grass. Place your intended furniture inside your marked off area to ensure you have the space you require. Visit your local home improvement center to buy paving stones. Paving stones come in a large variety of shapes and colors. The staff at the center can help you decide how many you need depending on the measurements you have provided them. You will also need to purchase sand as a filler and some crushed stone or pea gravel as a base. Staff at the store can advise you on quantities but it is always best to buy a little extra. Fill the area with leveling sand. Compact the sand with the tamper, use a wood 2x4 to level it off. Place a level on the 2x4 to ensure as you push it across you are holding it level. You will need a second set of hands to help you with this part. Lay your pavers! If they are irregular shapes start from the center and work to the outer edges. If they are square or rectangular shapes start by laying them around the four sides and work inwards. Tap them down with your mallet as you go. Adjust your plan and placement of stones to avoid having to cut them. If you need to cut for any reason, you will need to use a diamond blade saw. Spread sand or the pea gravel (crushed stone) over the finished area. Sweep it off into the spaces between the pavers. Hose down the patio with water to clean and encourage settling. Hey, you are done. Stand back and admire your work! 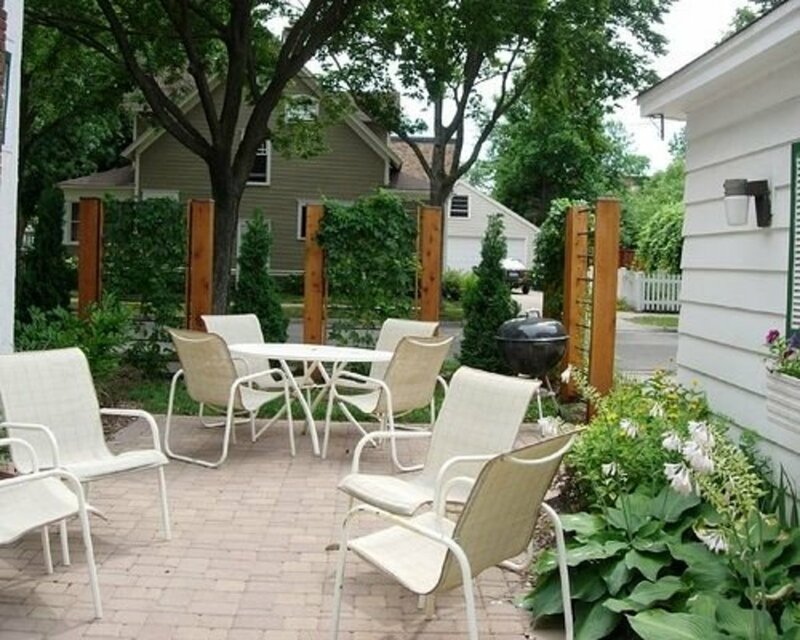 There are many materials you can use and many ways you can design a backyard patio area. Just scroll through the many photos below of unique yet simple outdoor spaces. It doesn't matter the size of your yard as all yards have corners. 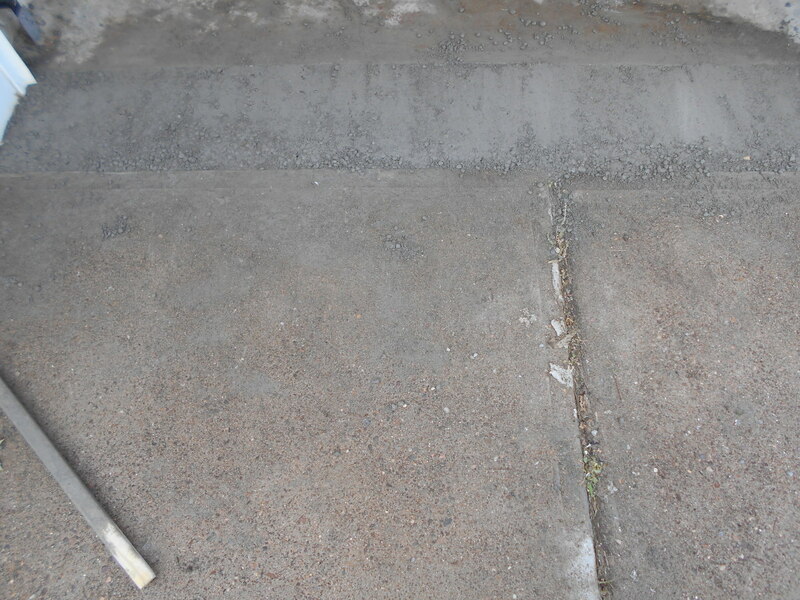 This corner involves the instalment of a few slabs of concrete enough for a solid area to put a table and two chairs. When choosing your corner remember to take into consideration the whereabouts of the sun during the day. The southeast corner will be pretty sunny and hot. If the purpose is to sit in the sun then that's fine but if it is shade you are looking for then a north west corner may be a better choice. Also, of note is what time of day you will use it most and if there are any shade trees near by. If you have large mature trees remember the roots may make digging difficult and your patio stones my not lie smooth. You can do a lot with shrubs and flowers. This design is very simple but looks like it too a lot of planning with the plantings. Digging out a focal point in the centre of your patio can be great for many uses. 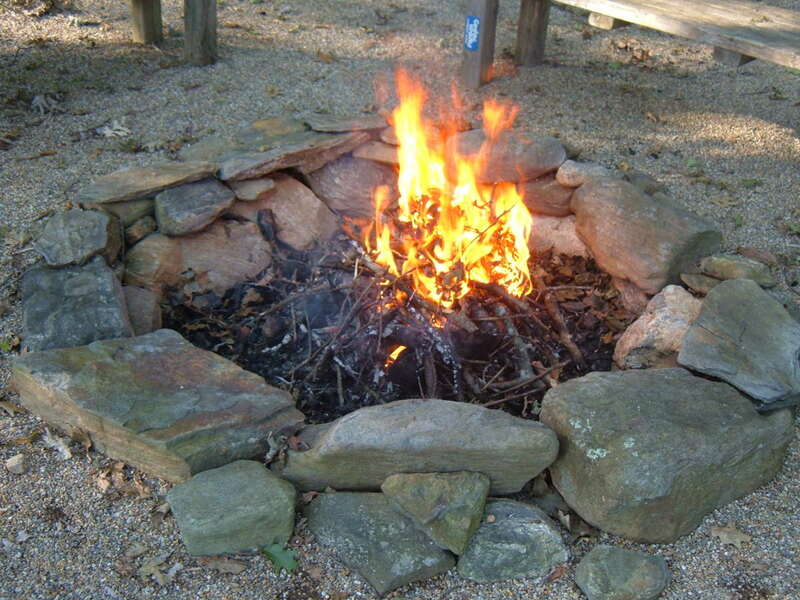 It could serve as a water feature or a fire pit. You could plant your favourite flowers in the centre. Perhaps even a hot tub? Use your imagination. 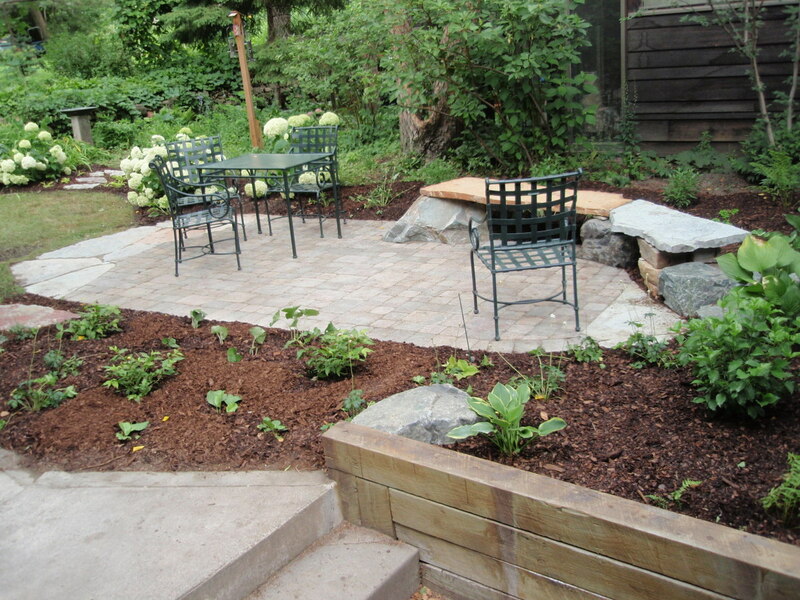 The rectangular garden bed around the patio could be planted with shrubs. Keep in mind the height of the shrubs you don't wanted them growing very high and obstructing your view or you many want large shrubs as a privacy wall. This patio is created on the diagonal with twists and turns creating different outdoor "rooms". One room is for sitting, one for flower displays. You could create a different looks by changing the flower display or the furniture in your room. A barrel would be a nice feature here with different plantings for each season depending on the climate you live in. 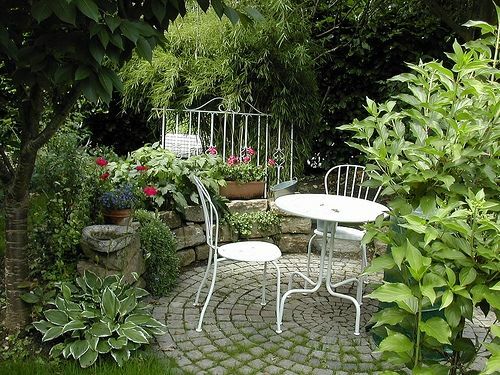 This is a very small patio but it creates the illusion of much more space because there is much for the eye to see. Escape to the forest in your own backyard. Use the trees and landscape that you already have and incorporate a sitting area. We need to get back to a natural environment especially if we live in an urban area. 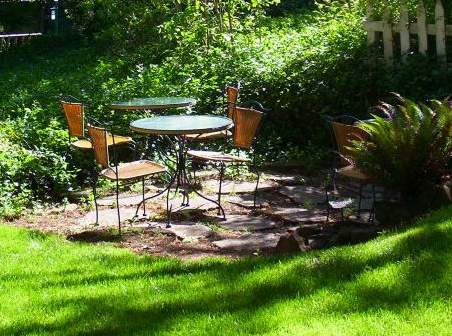 A sitting area in your own backyard amongst the trees and bushes can function as a great stress reliever. 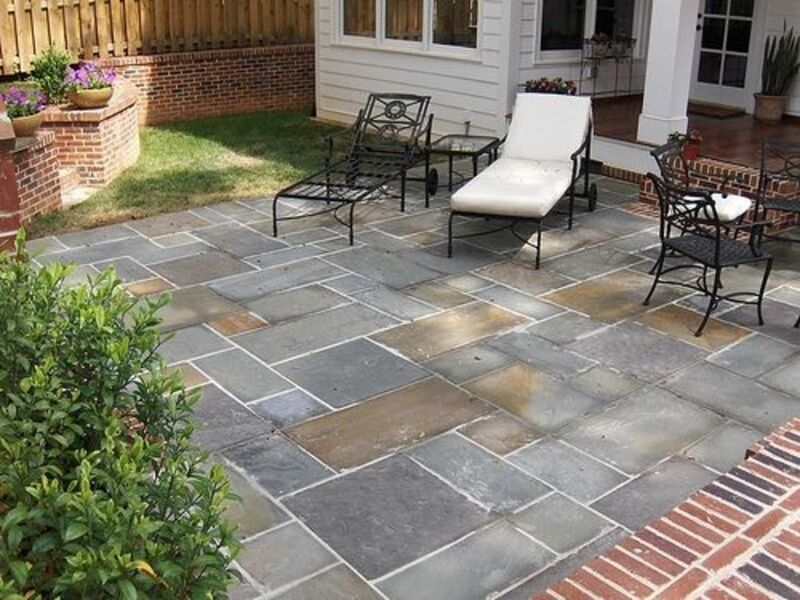 The pictured patio is made up of flagstone which is a natural material that is very durable. It may be a little more expensive but in the long run very cost effective as it is virtually maintenance free. As you can see the stones are just randomly places around the a dirt area where the grass has been dug up. The flagstone is put down and then area is then tamped down and watered and tamped again to make it solid. This creates a very natural look that blends into environment. 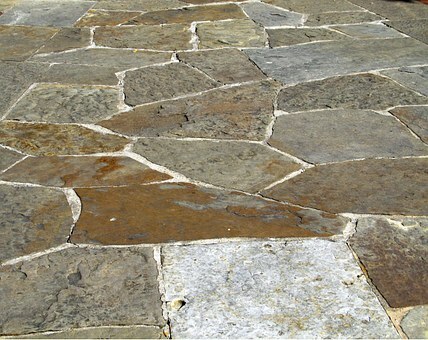 Flagstone is a great material for outdoor projects. Made from sedimentary rock it is a surface made by nature itself. It is a very durable surface and even when wet it is slip resistant. 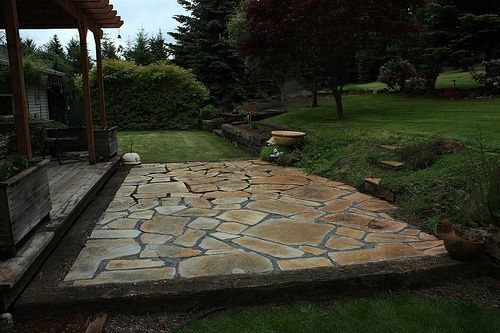 Flagstone can be installed easily on a sand base which makes it a great do-it-yourself project. For a more formal look it can be set in cement. Both methods are equally durable it just depends on the look you are after. Although setting it in cement is a little more complicated and takes more time and skill. Flagstone creates an inviting look to the backyard that really complements it's natural surroundings. 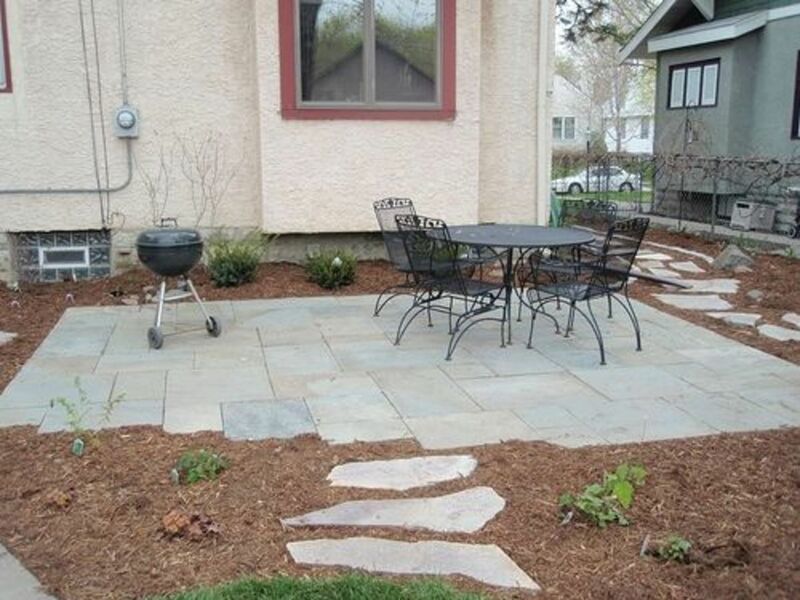 This patio is a little more formal and the flagstone has been set in concrete to keep it static. Another advantage to this is less maintenance as the weeds will have difficulty popping up through the cracks. Solar lights are a green and economical way of providing lighting to your outdoor space. Lighting extends the use of your backyard patio beyond sundown. Just imagine how relaxing it would be to sit outside among the stars enjoying your patio. These lights soak up the sun all day to provide a luminous glow at night. No need for electrical outlets,messy wires and awkward placements because you must have them near an outlet. You can place these lights anywhere you want for visual impact. 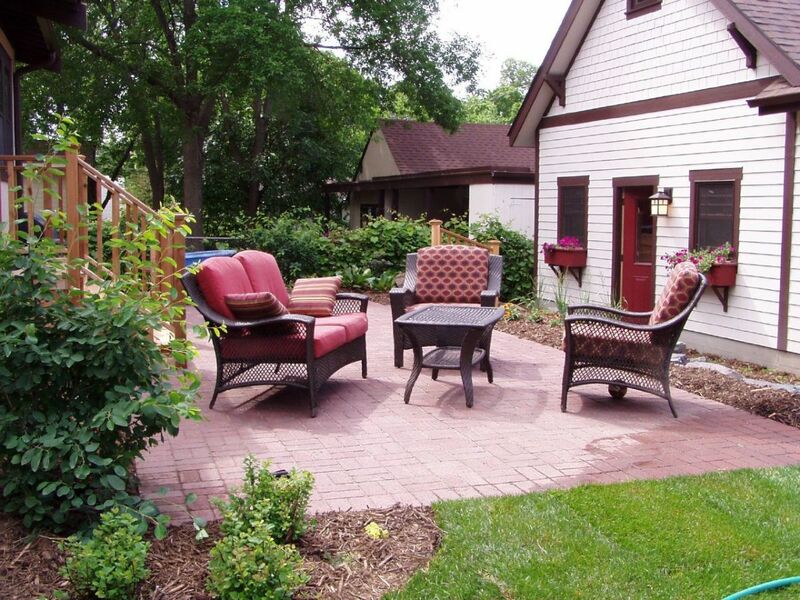 Here we see how a tiny patio can be put practically anywhere to create an inviting space to sit and relax. This little patio just needs some furniture or .... perhaps not - you can sit right down here, cross legged and breathe in the air. It creates an inviting entry way into the yard. All this patio installation required was a few patio slabs and a dug out area. No grass to cut here either. 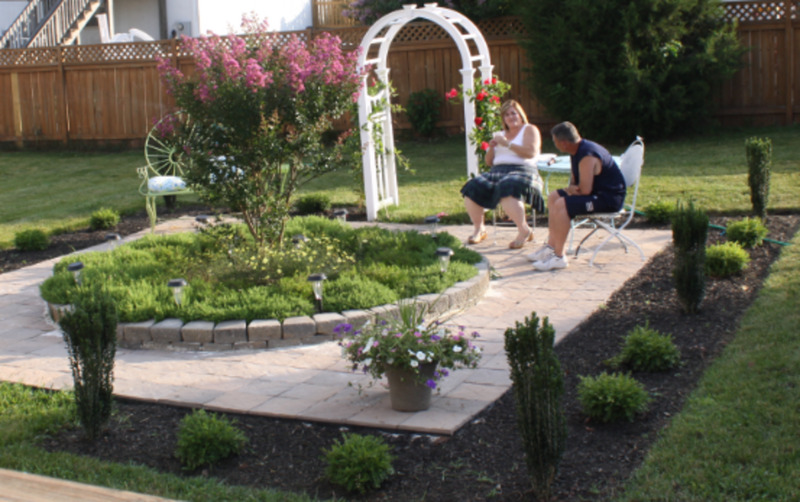 This is a very low maintenance patio with perennial plants that come up every year. This newly installed patio is just a simple square pattern angled on one side.It almost looks unfinished. A pathway of irregularly shaped stones take you the centre patio area and out to the side of the house as an exit. These stones were placed on a mulch foundation that is very easy to work with and very soft underfoot. Mulch is very natural looking and will absorb and keep water for plantings. This is great particularly for dryer climates. This patio is unique in its round shape, that creates immediate interest. This project can be a easy DIY if you measure correctly, you may not have to cut any stones. It may be a little for challenging to measure out the circle, but also more forgiving if you do make a mistake and have to insert a smaller stone. In this example the greenery is allowed to grow through the cracks and thus creates a very natural atmosphere. If you like this look be sure to keep the green growth cut back in order to keep the area from appearing as though it's being neglected! Here is a wonderful red brick backyard patio. Just a tiny little square area and it blends so well into the natural environment. The red of the paver bricks creates a brilliant contrast with the greenery of the yard. The colour of these bricks is what makes the most impact. Even if greenery starts to sprout in between the spaces of the bricks it would still look very appealing. Sometimes it is better to let nature take over your installation to some extent; it just makes it more beautiful. Here is a gorgeous example of a patio at the side of a garage. Try thinking outside of the box; a patio doesn't necessarily have to be in the backyard. Perhaps, you don't have the backyard space because you are on a corner lot. A patio can be enjoyed anywhere around your house. If you are concerned about privacy an extra fence, trellis or shrubbery can be added or you can sit and watch the world go by outside your door. Here is a very unique looking patio. It has a simple design that combines a hard surface with loose rock material as a filler and an accent. This can certainly be achieved as a do it yourself project. You can create something very unique using these materials and your own choices of colours and sizes. The addition of a canopy and posts make this design very attractive and increases its use to include rainy days. 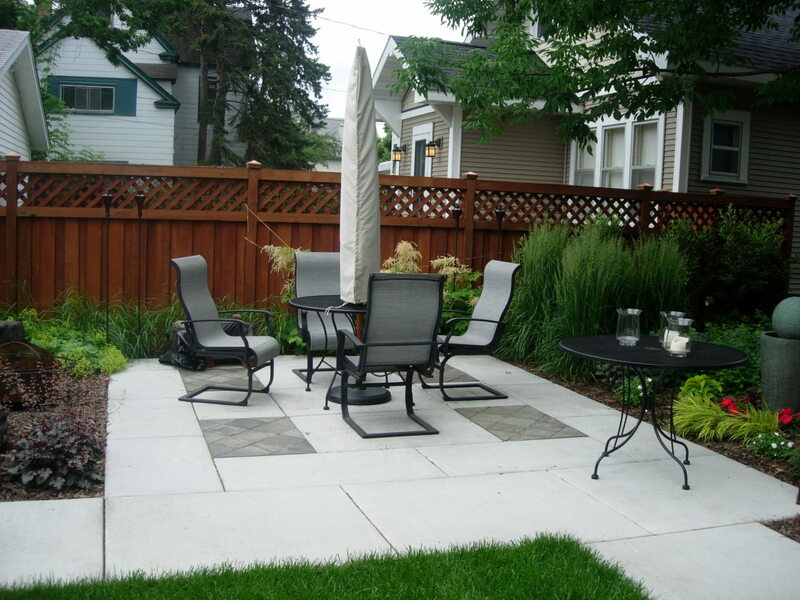 Here is a nice clean example of a small concrete backyard patio. Patterned in square and rectangles this type of installation is probably best done by professionals. Patterned concrete is not a do it yourself type of installation unless you have experience working with concrete. Large stones positioned correctly create extra seating in a bench style. This patio is small but still provides enough space for a table and several chairs. The centre is interlocking brick in square style with some flagstone at the outer edges to round it off. This creates interest and blends the patio with the stone bench. Once the plants grow out, it will look even more very natural and inviting. This design is plain and simple, just a large rectangle. No stone to cut if you plan it right and measure it out correctly. You can then just dig up the area and insert stones. Be sure to measure the stones and adjust your area dimensions so you can "put together the puzzle" without any additional cutting of stone. 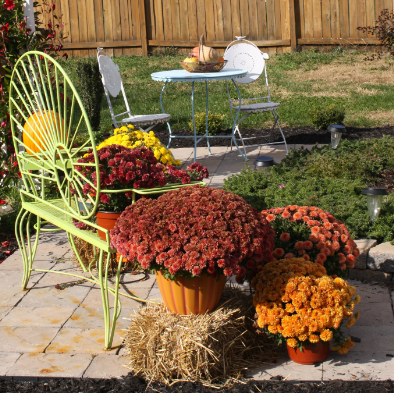 Create more interest by dressing up the area with scrubs and mulch. This is a DIY project that can be done in a day. The white pavers are arranged with a decorative grey stones as accents. It's a very simple rectangular design that requires no cutting if you measure according to your stone sizes. Paths leading to and from the patio make this patio the focal point of the yard. Loose material is an alternate for a solid base patio. 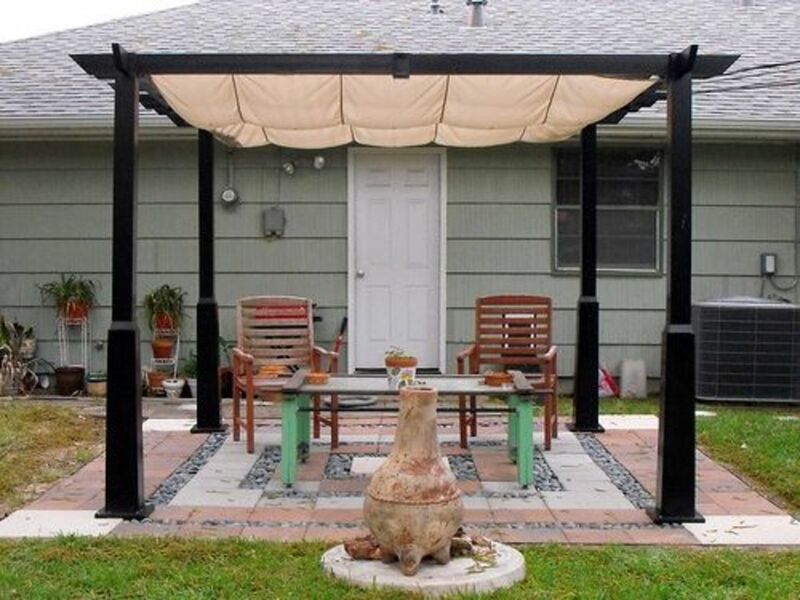 Very easy to install makes this type of patio a do it yourself (DIY). Do you have a favourite backyard spot to escape to? Yes, I do and I love it! Hey, I don't have a backyard, does a balcony count? Which Small Backyard Patio Design Do You Like Best? 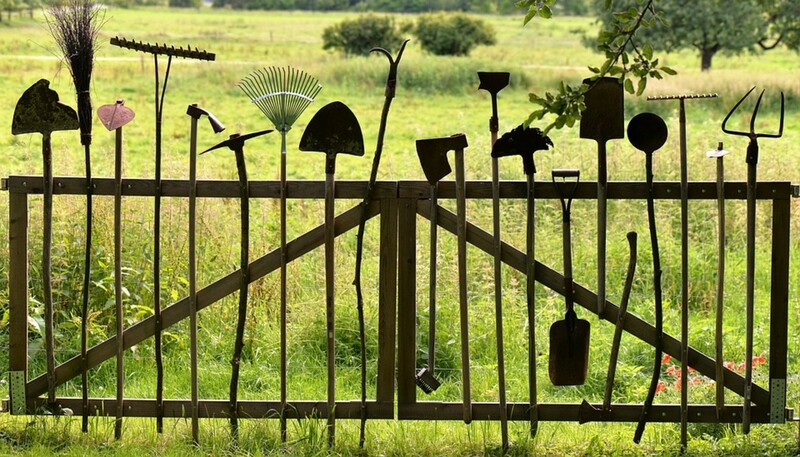 Where is a trellis made or bought? 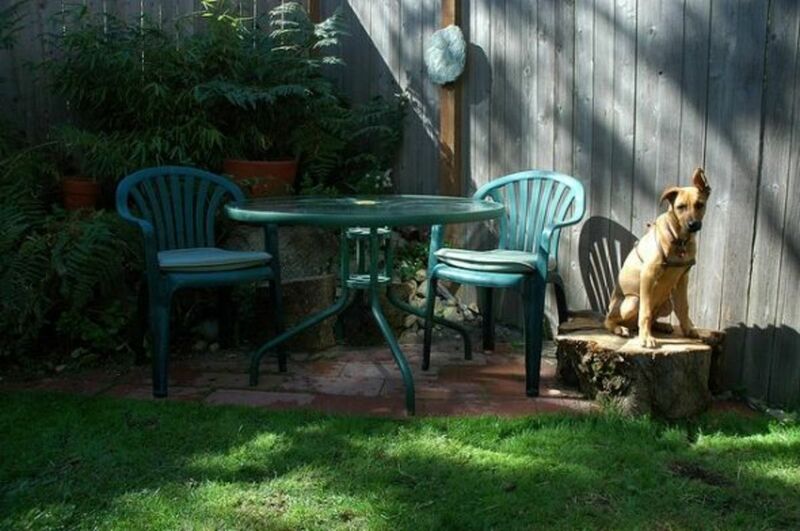 What a delightfully creative page about small backyard patios! Well done! I miss my screened in porch at my old house. The bugs here in South Carolina make it difficult to enjoy the outdoors sometimes. But the wind from the coast helps. We don't have a backyard patio, but we really enjoy our backyard. I make up backyard Olympics for the kids. Great article thanks for sharing! We have a small concrete backyard. Not wonderful but still pretty nice in summer timer. Well done - excellent lens! How perfectly charming. I wish I had a green patch at home. I am in the process of making a nice backyard area - it is going to another room in my home, one I hope to spend a lot of time in. I've done a few backyard patios in my recent life. I like small with impact ... adding pizzazz to tiny spaces. Actually thinking about another accent area in my backyard. Very nice page! We just love to spend time outdoors and having different little areas to sit in at different times of the day is great. Thanks for some wonderful ideas and tips! I love my backyard patio area, it is so nice!!! I want to find a cheap garden shed that I can put out there for storage. 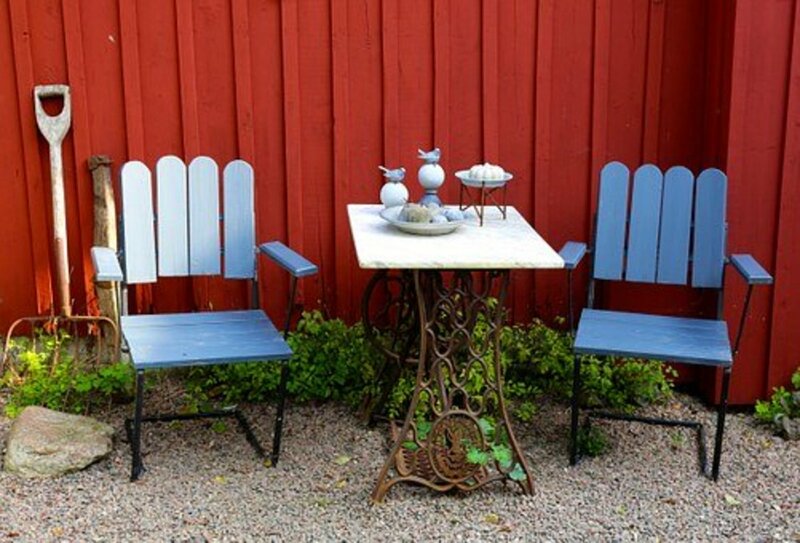 Your tips about how to build a small backyard patio are really great! beautiful ideas and very good advises...i am going to make a path and your lens is just came in the right time...thanks. 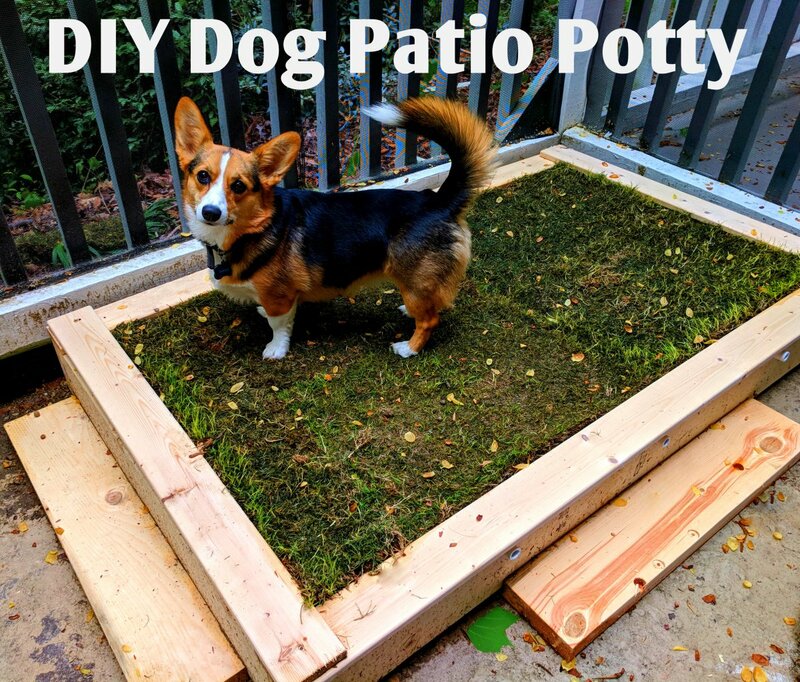 Some cute ideas for starting out making a patio. Nice ideas for patio designs. Love Love Love you lens on how to build a small backyard patio. I think I am ready to tackle this now. Thanks...great lens!!! I love the pictures you chose! I like the make a focal point idea! Someday I hope to have a nice water fountain big enough to sit by and write or just peacefully let my mind wander with the trickling waters. Great article! Both of your patio lenses are great. I pinned them on my home beautification board for when I can get to it. Squidoo Blessed. Great ideas. My parents have a patio area like these that they call their 'tiki'. They used the large stepping stones, added a nice table and unbrella set, it has a small rock pond and is surrounded by plants and tiki torches. When they light all the torches at night for these Florida Skeeters it reminds me of something from Survivor. Great ideas and pictures, I enjoy them. Thanks for all the ideas and information. Actually we have a front yard patio that we enjoy in the country. Wonderful, loved it. Loved the corner spot. Especially with your dog there with you. This is such a lovely lens, well done putting it together! I love my back yard. I call it my " Lil oasis, paradise".... Nothing fancy but it's mine. Love your lens. I love small backyard patio nooks. Very cozy. A peaceful oasis doesn't have to be large to be totally fabulous. Thanks for these great tips and ideas. yes, I do every day. I have a large garden but was looking to install small seating areas and this has perfect ideas. These are beautiful. It makes me want to spruce up my yard for the summer! I would absolutely love one! Hi I am out in my backyard everyday, I love the space. Great photos, I enjoyed reading your lens. I love it when people make amazing spaces out of previously boring yards. Great photos! I have a little patio that I enjoy next to my fish pond. Congrats on your purple star! Yes, I love my patio and am thinking of building another in a different area of the yard. Thanks! We live in California where the weather is warm most of the year. So we will eat meals on our patio. It's great. Yes - definitely! 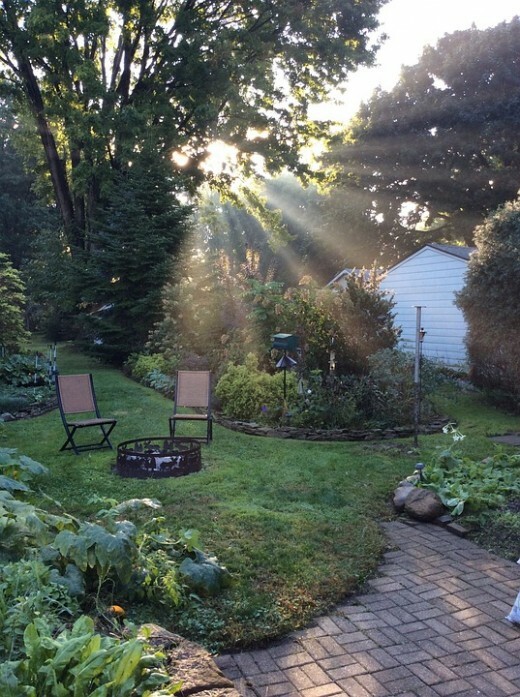 I recently moved and I really miss my old backyard paradise! However - it's time to create a new one! Thanks for the inspiration! Yes, a great place to sit and relax. We have a long path down the side of the house with a garden bench. With a small retaining wall in front for a flower bed, it makes a handy place to rest your mug. 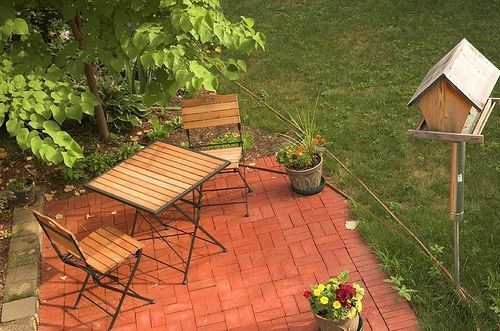 Your lens shows us that no matter how small, a patio is useful in a garden. I wish I had a flatter backyard so I could have a patio! This is a great idea. Amazing how a few blocks of concrete or stone can give you a place to commune with backyard nature. This is a great suggestion. I was just thinking of a setup the other day that included beach chairs as furniture. I liked them all. Made me think of a secret garden. me encanta las ideas que dejas sobre los patios traseros, los que estÃ¡n escondidos tras los Ã¡rboles son los que mÃ¡s me gustan. Preciosos !! 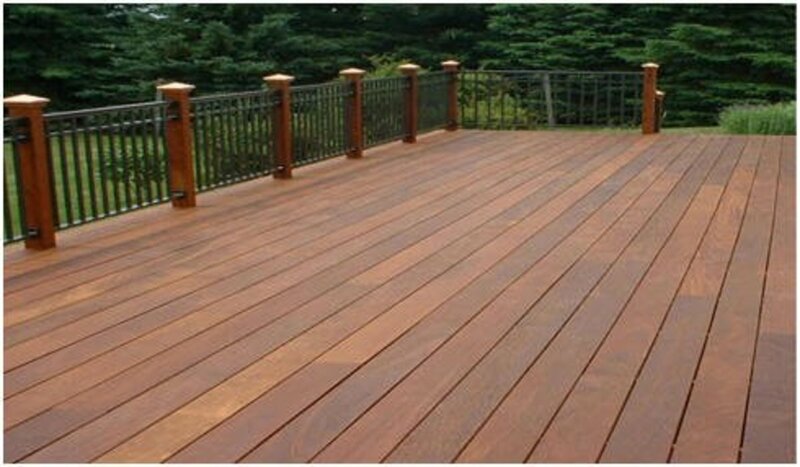 We are planning on building a wooden deck - hopefully, will complete the project within the next month or so, so that we can enjoy it this summer :) Great lens with excellent photos! I think to have a patio in the backyard is something really great. It will be nice to have a patio to relax. Thanks! I love your work here .Great ideas. We have several little patios around our yard. Thanks for the tips! I defintely enjoy my backyard deck/patio. This is where I putter around the most with my hanging plants and watch the hummingbirds. There are some great ideas and inspiration here! You made a great job. Thank you. Welcome to my Canadian Lensmasters on Squidoo lens. I do, but it needs work. 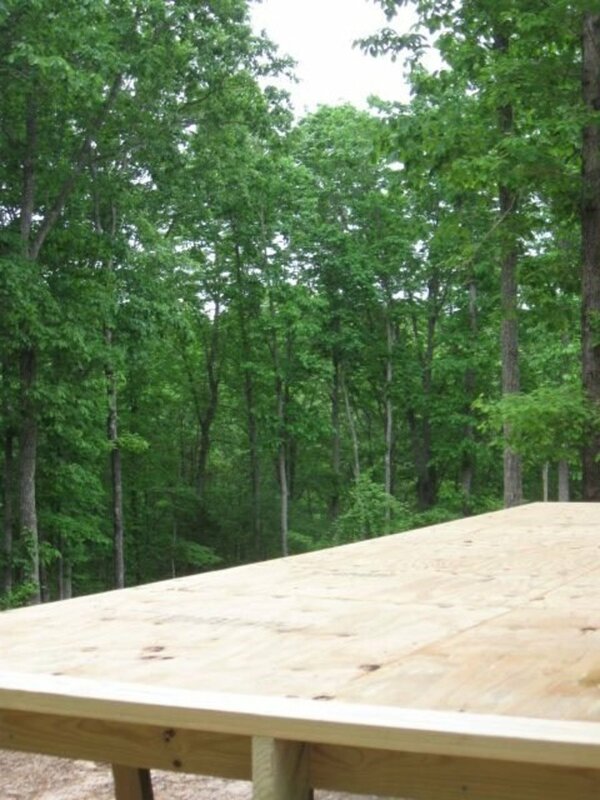 We have a big cedar deck where we love to sit in the sun and relax! Staycations can be great and relaxing with patios like these. Yes, I love it.Great lens, thanks for sharing, you made some great points. We're enjoying ours much more this year since we got a big umbrella and some comfy furniture! I love your idea of a patio hidden among the trees! We have porches rather than patios, but yes, I do love backyard patios and your great ideas and inspiring pictures! This give me some ideas for my yard. LOVE the pictures. Really helps the imagination imagine a great patio! Nice lens, looking forward to starting my own backyard oasis! Love the way you organized your lens.